Wandered down towards Greenwich at lunchtime to watch the flyover of 20 helicopters over HMS Illustrious as part of the week’s celebrations. I actually stayed on the north side by Island Gardens as I hoped to get shots of helicopters and the old naval college in the background. Alas, the helicopters were, as expected, too high – but also unexpectedly further north than I expected, so the photos didn’t happen. A collection of photos will be updated throughout the weekend. Thanks for the info. 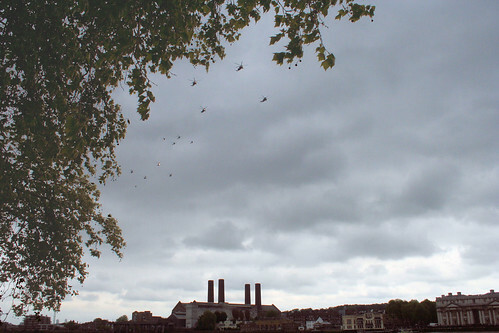 I did wonder why a formation of helicopters flew over Chiswick this afternoon. They must have been enroute to the airport in Northolt. That explains it! I was amazed to see these helicopters fly in formation over the National Archives yesterday lunch time. I did not know about this in advance and was impressed when they flew over the school where I work in Woolwich. Unfortunately I did not have my camera on me and I usually do! If it had been 10 minutes later then the kids would have been in the playground too and would have seen it. Never mind! I did go down to Greenwich after work tonight to have a look at te ship. Most impressive.